During the winter months, dogs' paws are often swollen and irritated. Examination of the interdigital area (between the toes) reveals red, inflamed skin. This condition is often very painful, causing the dog to walk with a limp. These problems can be reduced or eliminated if you are willing to spend a few minutes each day grooming your dog. Start with the fur between your dog's toes and pads. Keep this fur trimmed and short. If the fur is allowed to grow long, snow sticks to it, forming ice balls. These ice balls irritate the skin, causing irritation and inflammation. Nail care is also important. In the winter months, trim your dog's nails on a regular basis. 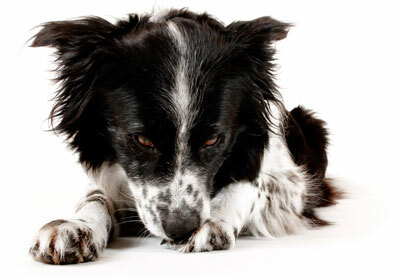 Not only do long nails irritate a dog's toes, they force him to walk on the backs of the paws, splaying his toes. Creating more space between the toes will allow more snow to cling to the fur. Cracked, sore pads are also a wintertime problem. Pads can become so cracked that erosions begin to form. The cracked, eroded pads are painful and can also cause lameness. This condition can occur in any breed but is often seen in larger dogs. Salt used for deicing roads and sidewalks is often the cause. The salt dries the dog's pads and causes them to crack. To prevent this condition, soak or wash your dog's paws (with warm water) when he returns home from the cold. We also advise drying them thoroughly.